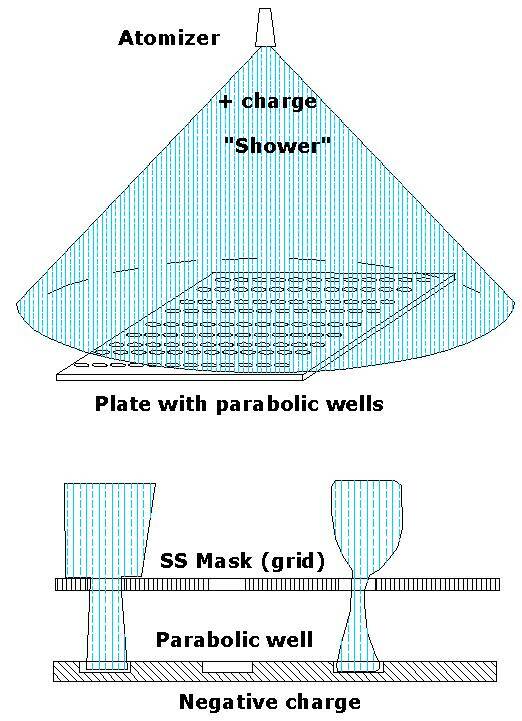 An area "shower" dispenser was developed as a simple and economical way of simultaneously dispensing sub-microliter volumes of a common reagent into a variety of receiving wells. This technique can simultaneously and precisely dispense small volumes per square area to trigger chemical or physical reactions. For example, simultaneous triggering of binding activity for comparative thermal signature evaluation of protein binding is absolutely essential due to its sensitivity and is ideally achieved by this "blanketing" technique. The "shower" type of dispensation can provide a "cone" of evenly atomized particles. According to TechElan’s evaluation, suitable results were achieved using various types of atomizing nozzles, including the best performing Ultrasonic Atomizer, which provided a very fine and adjustable mist with an even coverage area. In order to concentrate this "area" type coverage only into wells and to minimize loss of valuable reagents in between the wells, a special "mask" was introduced. The stainless steel perforated mask filters the atomized "mist" through precisely aligned and calibrated openings matching the wells. Reagent accumulated on the mask is recycled back into the supplying reservoir. Application of an electrostatic mask can further focus the atomized spray. This is achieved by charging the atomized flow and applying a controlling potential of the same polarity to the mask, and charging the receiving well plate with an opposing polarity.